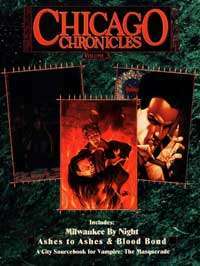 Chicago Chronicles Volume 3 is a compilation of three classic Vampire: The Masquerade sourcebooks: Milwaukee By Night, Ashes to Ashes and Blood Bond. Previously out of print and almost impossible to find, these books are now repackaged under a new cover. Volume 3 concludes the War for Chicago, telling the tales that unfold in the city under siege.